Most horse owners know the feeling. You get the dreaded call from the barn manager where you board your horse, or you walk out to ride your horse, love on him, give him treats, or whatever and you notice that he is not moving his legs properly. Perhaps he is favoring a leg, pointing a foot, or has a leg that is just hanging loosely. He is lame. There are many causes of lameness. The cause can be from bruising (over-reaching, brushing or cutting, buffing, speedy cut, threads, forging or clacking, coronet injuries, stumbling), arthritis, tendon problems, ligament problems, fractures, elbow problems such as dropped elbow, bad shoeing, problems with the feet or hoof, improper hoof angles Hoof Angles' Impact on Lameness Examined, flexor metatarsi, hip joint problems, hock involvement, heart problems, knee injuries, shoulder problems, splints, sore shins, sprains, spinal problems, stifle, laminitis, neurological problems, (as in hind end ataxia), wobbles, EPM or Lyme, ring bone, side bone, sesamoiditis, navicular, corns, pedal ostitis, soar backs, spavins, arthritis, tying-up, etc. Oh! I'm tired! The first thing I do is put my horse in his stall or in cross ties to examine him. Notice how your horse stands: Does he "point" a forelimb? Does he "point" each foot alternatively? Does he "point" a hind limb? Does your horse drop on one side showing that he is favoring the other side? This can be in front or behind. You can do a visual examination of how your horse moves. Have someone trot your horse towards you and watch his head and his front legs. Your horse may jerk his head and neck upward. If this happens watch to see what leg is hitting the ground as the head and neck jerk upward. Most likely that is the leg that is lame. Also, your horse may have an altered stride--or a short step on one side. The short striding leg would be the lame one. If you do not notice any upward movement of the head and neck then have your horse trot away from you. Carefully watch your horse's hocks and hind quarters. 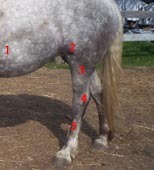 If you notice that one hip is carried high and the other hip drops, your horse is most likely lame in his hind legs. Try to determine which hind leg is lame by watching the hip. The side that is being carried higher is usually the lame side. You may also notice that your horse is taking short steps or short strides from the hind. The short stepping or striding leg is usually the lame one. Sometimes your horse may take short, choppy steps and strides. He may go in a very stiff fashion. This may indicate that your horse has lameness in both front legs and/or hind legs. I always call the vet when one of my horse's have lameness, but the following may give you an idea of what the problems may be by the symptoms you see. Check the strength of your horse's digital pulse. Use the thumb and middle fingers of your right hind. Feel behind, and on either side, of your horse's lower fetlock (above the sesamoid area) with your palm on the front and fingers rapped toward the back until you feel a faint pulse. Update: "Veterinarians can reduce a horse's severe forelimb pain by administering a continuous, low-dose infusion of the local anesthetic bupivacaine, but this method is not suitable for every case, according to researchers from Cornell University's College of Veterinary Medicine. A great deal of equine lameness comes from hoof abscesses. They occur when objects get into the hoof. Sometimes you will hear the terminology "gravel." It can be nails, thorns, punctures or cuts of any type, etc., that pierce the sole of the foot. (Underside of the hoof) Abscesses are very painful for a horse and must be treated. Eventually the offending agent will pop and drain or travel up the inside of the hoof and come out somewhere near the coronary band. Antibiotics are often administered. 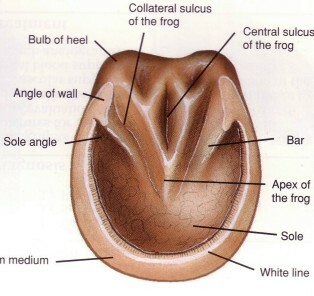 Canker is a chronic, hypertropic, moist podermatitis and is a destructive inflammatory disease of the hoof that generally originates in the frog, bars and adjacent sole and is accompanied by a foul odor. Typical treatments include superficial debridement, topical therapies such as the antimicrobial drug metronidazole, and good hygiene For more information on canker. Contracted heels are seen principally in the forefeet of light horses. It may be caused by improper shoeing that draws in the quarters, which prevents hoof expansion and adequate frog pressure. 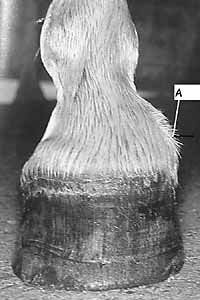 Dry hooves, excess rasping of the wall, and trimming of the bars are predisposing factors. The condition may follow the use of a hoof-immobilizing shoe, as used for fracture of the third phalanx. The frog is narrow and shrunken, the bars may be curved or almost parallel to each other, and the quarters and heels are markedly contracted and drawn in. The hoof horn is dry and hard. Lameness is evident when the horse is worked at speed. The length of stride is shortened, and heat may be noticed around the heels and quarters. "A corn is a specific type of bruising that is seen in the sole at the buttress (ie, the angle between the wall and the bar). It is most common in the forefeet on the inner buttress and is usually associated with the heel of a shoe that was improperly placed or left on too long and caused pressure on the sole. Shoes that have been fitted too closely at the quarters can also cause corns. Faulty foot conformation, straight walls that tend to turn in at the quarters, or contracted feet may predispose to corns. Other causes include excess trimming of the sole (which exposes the sensitive tissue to contusion) or neglect of the feet to the extent that they become long and irregular. Bruise or hemorrhage in the angle of the sole. Tenderness and inflammation of the coronary band with no apparent sign of injury; thread has sign of recent injury. Fractures anywhere, including the spine, may cause lameness. Navicular disease is essentially a chronic degenerative condition of the navicular bursa and navicular bone that involves damage to the flexor surface of the bone and the overlying deep digital flexor tendon with osteophyte formation on the lateral and proximal borders of the bone. It is a syndrome with a complex pathogenesis rather than a specific disease entity. It is one of the most common causes of chronic forelimb lameness in horses but is essentially unknown in ponies and donkeys. It should also be noted that for pain management: It has been established that dosing with Firocoxib for navicular pain and osteoarthritis has proven to be helpful. Any kind of nerve involvement might cause lameness or ataxia (coordination problems). Pedal ostitis is an inflammation of the bone inside the hoof, called the pedal bone or the distal phalanx. It is the very end bone of the digit and in the horse it is well developed and conforms in shape to the inside of the hoof to which it is firmly attached. Generally the pedal bone becomes inflamed due to concussion. The disease is more common in horses with flat feet and horses who are worked on hard ground. The front feet are usually the ones to be affected. X-Rays will confirm it by showing a reduced density of the bone and an irregular outline. This is demineralization of the bones. "Puncture wounds are usually the result of poor farriery technique but can occur when a horse steps on a penetrating foreign body. "Nail bind" implies that a nail has been driven close to the sensitive structures of the foot, causing acute pain. "Nail prick" means the corium has been penetrated. Puncture of the sole by a foreign body is associated with introduction of pathogenic microorganisms. Lameness is usually severe, especially when bearing weight; the degree may be similar to that of a fracture. 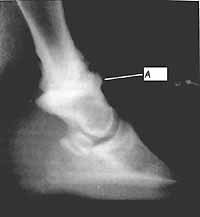 The horse may stand pointing the affected foot. There is increased heat and pain in the foot, which progress to the coronary band as abscess formation proceeds. Subsequently, there is edematous swelling of the pastern and fetlock areas. In neglected cases, there is draining at the coronary band after 2-3 weeks. Diagnosis is made by confirming the site of pain by pulling the shoe, using hoof testers, and paring the suspect area to locate the foreign body or its track. Prompt treatment with disinfectants and poultices is important for nail bind and nail prick. Ensuring adequate drainage from the site helps prevent abscess formation. In pricked foot, the prognosis is good, provided diagnosis is made and therapy begun early. If a chronic subsolar abscess has developed, treatment may be prolonged and the prognosis guarded. If infection spreads to the distal interphalangeal joint, the prognosis is unfavorable. Note: "Puncture wounds from nails or other objects are in a whole different category and need to be treated much more aggressively. If possible the hoof is radiographed (X-rayed) with the nail or foreign object still embedded so that the direction and depth of the penetration can be determined. The object is removed and a contrast solution is injected into the penetration tract. This contrast solution appears as bright white on a radiograph. If the navicular bursa has been penetrated then the contrast solution easily drops into the bursa, and the entire bursa and penetration tract are bright white on the radiograph. Ringbone got its name because inflammation and extra bone formation (osteophytes) appear as a ring of thickening around the pastern (pastern joint involved) or sometimes at the coronary band (coffin joint). A crack in the horn emanating from the coronet is the most obvious sign. Lameness is usually not seen. If infection is established, there may be a bloody or purulent discharge and signs of inflammation and lameness. Therapy involves surgery and corrective shoeing to change the distribution of weight on the hoof. Growth of new horn may be encouraged by application of a counterirritant (tincture of iodine) to the coronet over the crack. Iodine should be used with caution on light-colored or white skin. If the crack has become infected, an antiseptic pack is indicated. Patching techniques using acrylics or fiberglass are useful if properly and judiciously applied. Complete stripping of the wall caudal to the crack, being careful not to damage the coronet, is often the treatment of choice in early and severe quarter cracks, or when a hoof spur has formed. The hoof is then bandaged until new horn formation is evident. The horse is then shod with a three-quarter or three-quarter-bar shoe to relieve any pressure over the stripped portion of the wall." "Seedy toe is a condition of the hoof wall in the toe region, characterized by loss of substance and change in character of the horn. It is most often a sequela of mild chronic laminitis. The outer surface of the wall appears sound, but on dressing the palmar surface of the hoof, the inner surface of the wall is mealy, and there may be a cavity due to loss of horn substance. Tapping on the outside of the wall at the toe elicits a hollow sound over the affected portion. The disease may involve only a small area or nearly the entire width of the wall at the toe. Lameness is infrequent but accompanies the occasional infection and abscessation. The white line is the junction terminal hoof wall and the sole. Actually this junction is seen as a yellow line on the solar surface of the foot. Cavitation in the distal hoof wall, usually dorsally, involving the stratum internum and/or stratum medium. Commonly seen as widening of the sole wall junction. White line disease is a keratolytic process involving the deeper non-pigmented zone of the stratum medium. A Sidebone is a term that describes the process where areas of cartilage in the foot become hard and bony. When this happens it may cause no problem at all, or it may interfere with the way the soft tissues around the area stretch and adjust during exercise. This can cause pain and discomfort. Most cases of sidebone do not result in pain. The cause is unknown but it is most likely to be due to poor conformation or improper shoeing. This causes abnormal pressure and impact on certain areas of the foot. On each side of the cannon bone is a small bone known as the splint bone. The small splint bones are thin and taper to become a small knob about two-thirds of the way down the cannon bone. A ligament, located between the cannon bone and the splint bones, is quite elastic in young horses. As the horse ages, the ligament ossifies; that is, the ligament is replaced by bone and the three bones fuse. During ossification, there may be inflammation and pain. Jumping, running and working a horse during this time produces further irritation. Splints usually occur in horses 2 to 5 years old. Most often it is the forelimbs which are affected. Splints rarely occur in the hind limbs. In older horses, the splint bones are fused solidly to the cannon bone. Lameness due to splints is most common in 2-year-old horses undergoing training. The lameness is most obvious while the horse is trotting or working or soon thereafter. Lameness may come and go or be present continuously for as long as a year. If you probe up and down along the cannon bone, the horse will flinch when the portion of the ligament undergoing ossification is touched. A large swelling or a number of smaller swellings due to ossification may occur along the length of the splint bones. After the ligament has ossified, the swelling and soreness usually disappears. Sprains may occur in either the front or the hind legs. They seem to be more prevalent in the front legs. Sprains involve tendons, sheaths, and check ligaments. Perforatus Sprain - Swelling is mainly in the middle line at the back of the leg. Perforans Sprain - Swelling is mainly at the side of the tendon. In both, the toe is dragged and there is difficulty in bending the joints. Check Ligament Sprain only - There is little swelling if any. The joints can be bent with ease. The strain only comes on the ligament when the foot hits the ground. The horse exhibits pain and lameness. Joint Sprains - There is pain on palpation and swelling at the site. "Thrush is a degeneration of the frog with secondary bacterial infection that begins in the central and collateral sulci. It results from poor management and hygiene that permit horses to stand in wet conditions for prolonged periods and from failure to clean the hooves regularly. It is more common in the hind feet. The affected sulcus is moist and contains a black, thick discharge with a characteristic foul odor. These signs alone are sufficient to make the diagnosis. Fractures of any bone, including in the spine, will cause lameness. The hock does not flex freely. Usually a horse will drop on his sound side if he is lame in or below the hock. If a horse is lame above the hock he will drop the lame side. There are a number of causes of hock lameness. Pronounced lameness on hard ground. Thoroughpin - (Bursal enlargement) There are two fluctuating swellings above the hock on either side of the Achilles Tendon. There is not always lameness with this. Bog Spavin - This is a distension of the true hock joint capsule. There is inflammation. There is swelling in the front of the joint. There may be severe pain, lameness and fever. Bone Spavin - Exostosis on the lower and inner part of the hock. The hock does not flex properly. The toe drags. Most horses will go lame if turned sharply. Lameness often decreases with exercise. An X-Ray will confirm bone spavin. Occult Spavin - Same as bone spavin without exostosis. Curb - Ligament sprain at the back of the hock. This can usually be found about 5 inches from the point of the hock. There will be a hard swelling, lameness, and difficulty in extending the hock. DOD, OC,OCD, and SBC Medical DOD, etc. Pinched nerved or any sort of nerve involvement can cause lameness or ataxia (coordination problems). The horses stifle is the same joint as the human knee. Just like the human knee there is a knee cap, the patella, a small flat bone that rides back and forth in the front of the femur. The patella connects the large muscles in the front of the upper leg with the long bone of the gaskin using three large ligaments. When this muscle contracts it pulls up on the patella and helps to straighten the leg out. Unlike the human knee, the horse is able to hang the medial (inside) patellar ligament over a bony prominence of the femur, intentionally. By doing so, the leg is locked in extension, and the horse can rest and sleep standing up. Some horses have trouble with unintentional interference or even have the leg lock up and unable to flex normally. Even worse, the traditional surgical treatments for this condition have been found to cause permanent low grade lameness. Some horses may have stifles that once locked cannot be suddenly released. They either have very straight, upright back legs when born or have poor quadriceps muscles. If a horse shows a slight hitch in their gait then this condition is subtle and is especially noticed when going downhill. However, the condition can also be severe when the leg is completely locked out behind the horse with the leg being unbendable. This condition is called upward fixation of the patella. There are a number of treatment options including exercise that includes working up and down gentle slopes or lunging in sand to more serious treatment options such as injections along the patella and surgery. It should be noted that diseases can cause lameness and ataxia. Usually the lameness stems from a neurological problem which can be the outcome of a disease. Such diseases are Lyme Disease, EPM, West Nile Virus, and others. Wobbles can also cause ataxia. Parasites can cause lameness if the infestation is heavy and affects an area that can cause lameness. Some parasites will migrate to the legs and cause tendon and ligament problems. Tumors and other growths can cause lameness. Tying-up or azoturia can render a horse unable to move or to move in a lame way. I use The Merck Vet Manual as my reference for my horses. It is the most comprehensive medical reference that I have found.